and Why is it Better Than Pasteurized? Real raw honey comes straight from the beehive and is a potent superfood sweetener gathered by one of the most profound creatures on planet earth, the honeybee. 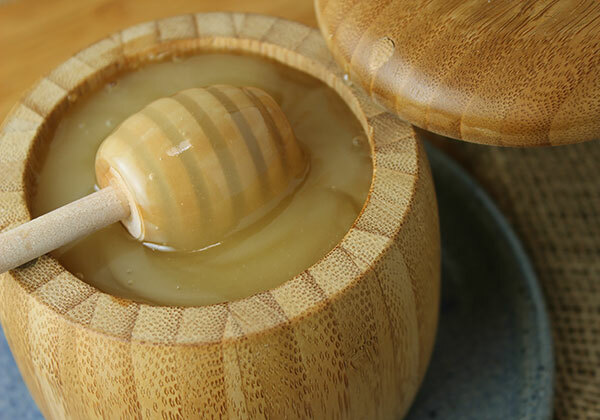 Unlike much of the processed honey most people are used to, raw unpasteurized honeys are nothing like these common, highly glycemic watered down versions. Pure honeys are unheated natural sweeteners that still retain all of the nutrients, enzymes and medicinal compounds that honey is known for. Honey in this state is a living food high in antibacterial, antifungal and antiviral properties used throughout the ages to reduce inflammation, boost the immune system and aid digestive functions. 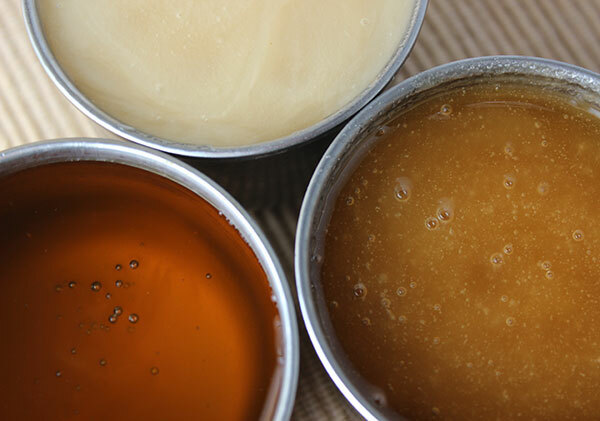 Raw honey can either be filtered or non-filtered yielding a number of consistencies ranging from a pourable thick syrup to a dense crystallized paste. Non-filtered honey is by far the most medicinal honey available, containing fragments of nutritious constituents, like propolis, bee pollen, small flecks of honeycomb as well as different active enzymes beneficial to human health. Some types of raw honey are minimally processed to produce either a more fluid texture, clearer color or to strain out these particles to create a more uniform product. All honey labeled "raw" is never, however, heat pasteurized. Many of the commercial honey products found in mainstream grocery stores here in the U.S. are ultra-filtered, removing most of the nutrient-rich elements. They are then high heat pasteurized which kills all beneficial microorganisms and other health enhancing components. Pasteurization and extreme processing destroys almost 100% of vitamins, minerals, antioxidants and antibiotic properties typically found in abundance in true beehive honey. Some honey is not even honey, but low quality Chinese exports that are blends of either high fructose corn syrup, beet sugar, lactose syrup with very little honey content. These honeys also typically have antibiotics added to them. Often referred to as "funny honey" by small scale honey producers, this type of honey can be sold cheap and has been known to drive local beekeepers out of business. Some corporate honey manufacturers are also known to promote abusive and inhumane beekeeping techniques that involve high fructose corn syrup feeding and artificial insemination as well as the killing of the queen bee and replacing her with a younger artificially raised queen. We highly recommend supporting either local or small scale companies who embrace traditional local, in-season-only, low-stress beekeeping methods that ensure happy strong bee colonies. The best honey is certified raw and organic, produced by beekeepers who maintain these respectful and healthy beekeeping practices. Many primitive civilizations understood the natural power of honey as a healing food source and have been harvesting it from wild beehives for thousands of years. First early evidence of the human consumption of honey dates back to prehistoric cave paintings in Spain over 8,000 years ago. It is recorded in ancient Biblical, Chinese and Egyptian texts as well as mentioned throughout the ages by many naturalists and early pioneers of Western medicine. Numerous Native American tribes were also known to use harvested pollen and honey from wild hives. In ancient Egypt unprocessed honey was used for embalming the dead and considered a sacred food, often made into cakes as a gift to the gods. 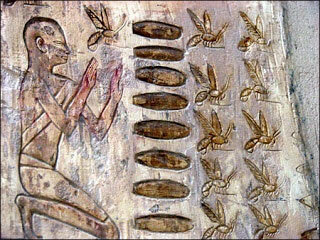 Human efforts to domesticate wild bees is depicted in Egyptian art about 4,500 years ago. However, a complete understanding of bee colonies did not occur until the 18th century when Europeans first created the moveable beehive. In addition to honey, the beehive also produces propolis, honeycomb, bee pollen and the infamous royal jelly, reserved exclusively for the queen bee and her larva. All of these bee products have been consumed extensively throughout human history. Honey is a very sweet food created by different species of honeybees, most commonly in the genus Apis, who collect the sugary nectar close to the vicinity of their hive location. The harvested nectar is converted to honey by a regurgitation and water evaporation process and is stored inside the cells of the wax honeycomb. The nectar is partially digested by the bees who add enzymes through salivary secretions which change the chemical structure and pH levels. Invertase and digestive acids naturally hydrolyze the sucrose content in the nectar into glucose and fructose. Interestingly, all nectar collecting worker bees are female and work together as a group to achieve this objective. Because the nectar is high in water and yeast content that would soon ferment, inside the hive the honeybee remarkably knows to fan its wings to create a strong breeze or draft of air across the honeycomb. This speeds up the evaporation process and concentrates the sugars. When the moisture content has dropped below 18%, the bees cap the honey-containing honeycomb cell with fresh wax. When honey is ripe, it is ready for harvest by the beekeeper. If using sustainable beekeeping practices, the beekeeper always leaves a portion of honey for the hive population. Much of this honey is used by bees particularly in off-seasons when other food sources, chiefly nectar and pollen, are in short supply. Typically, bees produce 50-100 times more honey than they would potentially need in the winter months. Most of the year, a bees diet is primarily made up of nectar, pollen and water, not honey necessarily. 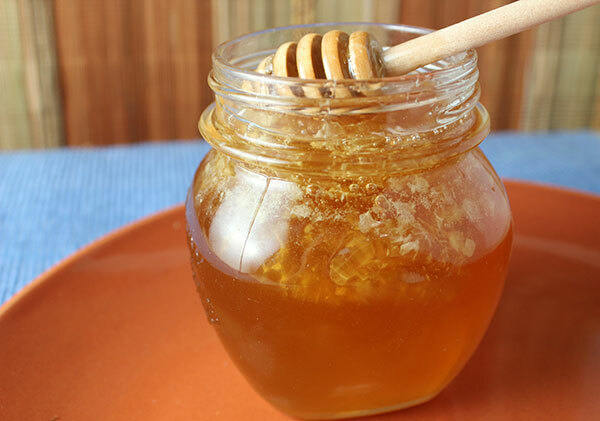 Raw honey, although not technically considered a "raw vegan" food by some raw foodists, can be an extremely beneficial alternative sweetener for active individuals, but like other high glycemic sugars should be used in moderation and is best suited for constitutions who primarily use carbohydrates as a fuel source. Consuming any kind of honey, or other sugars with a high glycemic index, is not recommended for diabetics or those with candida overgrowth as it will cause a substantial increase in blood sugar and promote the proliferation of non-beneficial yeast strains. In addition, individuals with any form of cancer or a past history of tumor growth should largely avoid all concentrated sweeteners and fruit sources, generally following a no or low sugar diet protocol using zero glycemic sugars, like monk fruit, stevia or Lakanto. Raw honey contains an abundance of nutritional elements and a broad spectrum of vitamins, minerals, antioxidants and amino acids. Some of these nutrients include Vit. C, riboflavin, niacin, pantothenic acid and other B vitamins, along with minerals such as calcium, iron, potassium, zinc, magnesium, phosphorus and manganese. As we mentioned raw unfiltered honey can contain specks of bee pollen, propolis and honeycomb that integrate into the honey as smaller-sized molecules, but are usually not visually noticeable. The amounts of these ingredients can vary greatly from honey to honey. In a published study in the Journal of Nutrition and Metabolism analyzing the effects of natural raw unprocessed honey on human health it was observed that "The intake of honey as food and medicine resulted in high nutritional benefit and therapeutic promise. The botanical origin plays prominent roles on the bioavailability of natural honeys phytochemical compounds, which consequently has effects on the biological activity of honey." All raw honeys fluctuate in quality and nutritional value according to the sources of nectar collection. Raw or real honey is usually labeled according to what flowers it is obtained from as each comprise their own set of nutritive properties. 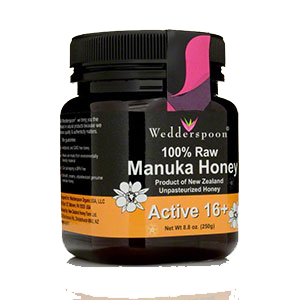 Some popular types of honey include those sourced from wildflowers, alfalfa, clover, buckwheat or other specialty types, like manuka and sidr (jujube tree). In the same 2012 study previously mentioned, it states that "Irrespective of the floral source, variety and number (mono, polyfloral or blended); honey type; concentration; bee (sting or stingless), all contain antioxidants and exhibit various degree of biochemical activities attributable to natural honeys potency and value as a nutraceutical agent." The only completely accurate way to confirm the flower source is by analyzing samples of the pollen, a technique referred to as melissopalynology. A bee's pollen when observed closely can tell us many things about the honey, like the plant species in which it was derived and if it contains any contaminants, like pesticides, herbicides or heavy metals from the environment. These pollutants are common in non-organic crop-sourced honey and large scale beehive production which often transports their bees to pollinate conventionally-grown agriculture crops. Natural living honey contains therapeutic amounts of both bee pollen and propolis, in addition to beneficial enzymes that help to improve digestion. The primary enzymes present in raw honey include invertase, amylase, glucose oxidase with smaller amounts of others like catalase, beta-glucosidase, protease, esterase and acid phosphatase. As with other nutrients in honey, the levels of these enzymes can vary widely according to region and flower source. In the past, the amylase content in honey was frequently used as an indicator of honey quality, especially in European countries. 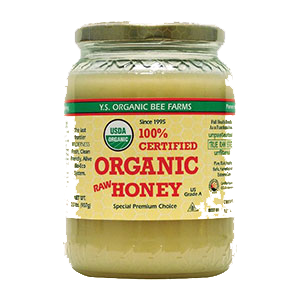 It is present in varying quantities in all raw unheated honey and produces both maltose and dextrin from long chain starches, providing a sweeter flavor. Amylase is an essential enzyme in honey that helps to break it down, making it easier to digest when consumed. 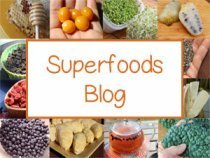 Bee pollen is a top 10 superfood for its nutritional benefits, protein and concentrated enzymes. The pollen in honey is the main constituent responsible for its amino acid content. Although these pollen granules are traditionally harvested in separate collection trays from the actual honey, unfiltered honey does include tiny bits of pollen and contributes to its nutrient-rich quality. Honey bees collect a resinous substance called propolis, used for constructing and maintaining their bee hives, often referred to as "bee glue." A mixture of waxes, essential oils, resins and pollen, honeybees use it to seal and sterilize the hive from outside contamination as it possesses strong antibacterial and antibiotic attributes. Propolis is also used to sanitize the lining of brood cells used for laying eggs. Like bee pollen, small particles of propolis resin are also found in raw honey and add immensely to its value as a superfood sweetener. Propolis contains beneficial compounds and health supporting properties as a natural antibiotic and antiseptic agent. Unpasteurized honey has been used throughout the centuries as a food source as well as a medicinal remedy in the treatment of various ailments from mild conditions like sore throats and arthritis to more serious health issues like gastrointestinal ulcers and bronchitis. 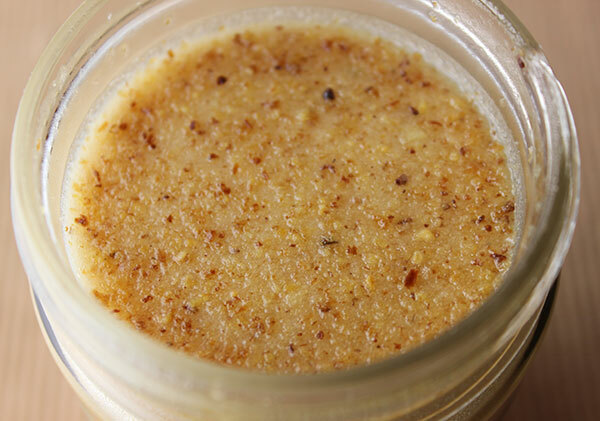 When used topically, it is also a powerful skin healer, commonly used as dressing for wounds, rashes, burns and as an ingredient in facial masks. External use increases circulation to the affected region, stimulates the re-growth of tissue, speeds healing and helps to prevent scarring of the skin. Different from antibiotics, which kill all bacteria and interfere with intracellular metabolic pathways, honey provides antibiotic and antimicrobial actions through a combination of different properties. Its antiseptic qualities are due to certain chemical compounds, like propolis and hydrogen peroxide, which exhibit strong antibacterial attributes. The enzyme glucose oxidase found in the nectar produces beneficial amounts of hydrogen peroxide when the honey is ripe. The high sugar content of honey also hinders the growth of many microbes as does its pH acidity. 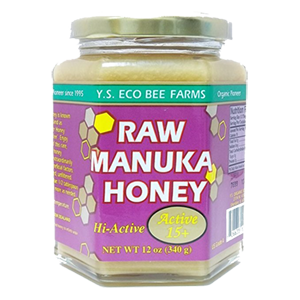 Raw honey is an effective immune system modulator, containing antioxidant constituents, phenolic acids and flavonoids. Typically used for treating colds and viral infections, the consumption of honey can also act as a preventative before mild as well as more serious immune system disorders take root. Local honey is additionally known to provide relief from allergies when taken a few months before pollen season. Ingesting raw natural honey offers effects as an anti-inflammatory agent, reducing the activities of both cyclooxygenase-1 and cyclooxygenase-2. The pharmacological inhibition of cyclooxygenase (COX) is known to alleviate symptoms of inflammation. In one 2014 study analyzing the analgesic and anti-inflammatory effects of honey, "The results showed that honey reduced pain perception especially inflammatory pain." Propolis is one of the constituents in honey proven to reduce inflammation and pain when consumed or used topically to treat wounds or inflamed conditions. Herbalists around the world have used honey medicinally for centuries as a sleep aid and to sooth the nerves. Honey is often prescribed prior to bedtime to help promote the release of melatonin, the hormone required for both the recovery and rebuilding of tissues during our rest state. This theory is explained by what some people call the Honey-Insulin-Melatonin Cycle, or the HYMN Cycle. In addition, the enzyme glucose oxidase produces gluconic acid from glucose in honey which helps in calcium absorption. 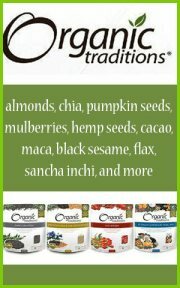 Calcium is also known to contribute to the activation of melatonin. Raw honey is a great alternative sweetener because of its nutritive and medicinal properties, but it is, however, a high glycemic sugar. The glycemic index of honey does fluctuate some according to its fructose content and other variables. Generally, raw honey is viewed as having a lower GI than pasteurized honey. The "glycemic index" is a numerical ranking of carbohydrates based on the rate of glycemic conversion and the rise of blood sugar levels after digesting a food. One tablespoon of unprocessed honey typically contains 17g of carbohydrates and about 64 calories. The main sugars in natural unheated honey include fructose (32-38%) and glucose (24-31%). Other sugars include maltose, galatose, small amounts of sucrose and 4-5% fructooligosaccharides or FOS, prebiotics that promote the growth of nonpathogenic intestinal microflora. 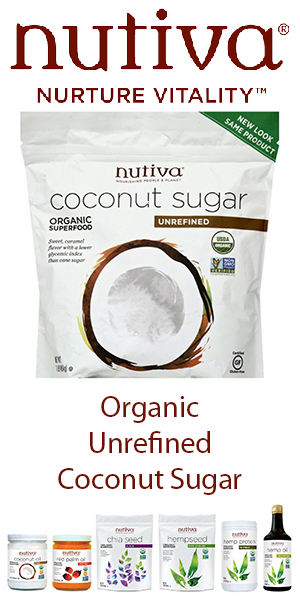 When consuming natural sweeteners with a high sugar content, like honey, coconut sugar or agave nectar, it is important to not overdo it and always use them in moderation within a health promoting diet. Avoid raw honey if you have issues with candida overgrowth or parasites as most of its sugars will feed their growth and proliferation. 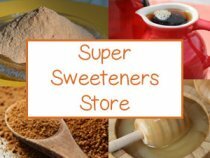 It is best, under such conditions, to consume low glycemic sweeteners like stevia, lakanto, yacon root syrup, xylitol, monk fruit, coconut nectar and sometimes lucuma. Backyard beekeeping is becoming a popular homestead practice in rural communities worldwide. Small scale beekeeping is an intimate relationship with bees and their complex community-based management systems. They are great examples of what it means to work as a group to achieve a collective goal, the continued survival of their colony. We personally believe there is great value in the art of holistic beekeeping and there has never been a more crucial time to help encourage flourishing bee populations and the integral role they play in the bio-diversity of our ecosystems as well as our food supply. Through their nectar collection process, they naturally pollinate the flowers of most food-based crops and are necessary for their growth cycle to maturity. "Colony Collapse Disorder", is a fairly recent phenomenon whereby bee populations around the world seem to be disappearing and reducing in size. Mainly happening within the large scale commercial beekeeping industry, there are many theories about what exactly is causing this occurrence. Scientists believe it is a combination of different factors including pesticide use (like neonicotinoids), monocrop agriculture as well as habitat loss. As we shift over to a more sustainable organic way of growing food, incorporating permaculture practices and reducing our carbon footprint, backyard beekeeping can be a simple and effective way to make an impact one nurtured beehive at a time. Honey is sourced from different flowers that are located near the hive. Depending on the bee species, they can harvest nectar from one exclusive flower or a variety of different ones located with a 1-4 mile radius. Each type of honey holds a unique composition of nutrients and flavors relative to its derived nectar. 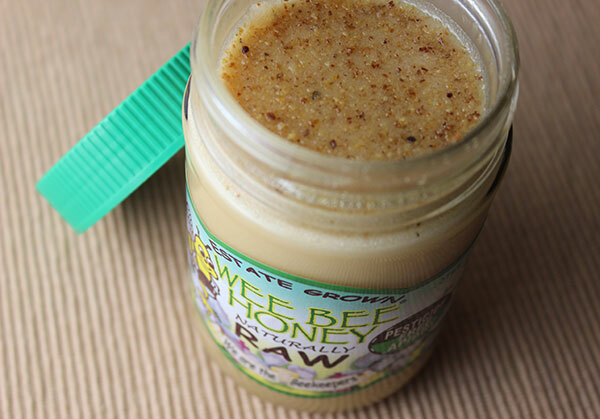 Try raw honey in some of our raw desserts like halva, coconut cream pie or raw chocolate bars. The best honeys are purchased directly from the beekeepers themselves in the communities you live in. Sometimes farmers markets are good places to find local honey made from small scale beekeeping operations. We also love to talk directly with bee keepers whenever possible. They are usually very interesting people with a lot of information about honey and bees in general. 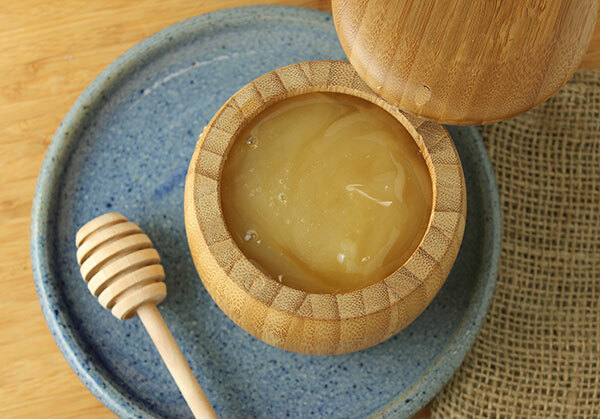 Local honeys are additionally beneficial to consume as they can potentially help you to adapt to pollen sensitivities, building allergic immunity in the locations you reside. Consuming honey for allergies is usually recommended over ingesting the straight bee pollen as pollen concentrations can cause severe allergic reactions for a select group of people. We believe it is important to support your local beekeepers or purchase your bee products from reputable companies as opposed to commercial, mass produced bee product corporations who inhumanely treat their beehive colonies or adhere to unsustainable beekeeping practices. It is best to consume honey that is foraged from grasses, trees, plants and wildflowers far away from any possible environmental pollutants. Organic raw honey is certified according to the land in which the bees harvest the nectar with required pollen testing for potential contaminants. Weebee - Contains all three nutritional elements including pollen, propolis as well as honeycomb, creating a creamy textured end result. 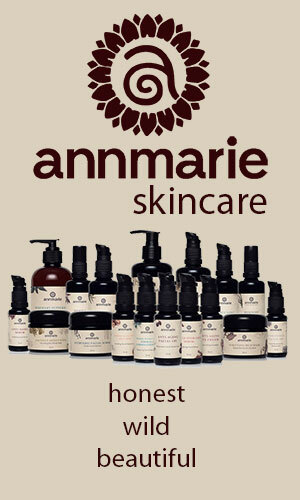 Produced from biodynamic floral sources. 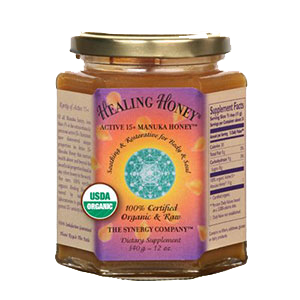 Manuka Healing Honey - Created by the Synergy Company, the makers of many superfood products. 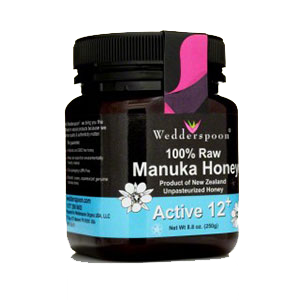 Hand harvested in New Zealand, it is an organic raw manuka honey. 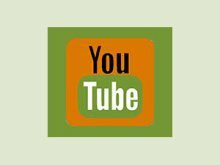 EcoBee Farms - Y.S. Eco Bee Farms is a four generation hands-on beekeeping business. They are the pioneers in certified organic beekeeping in North America, receiving organic certification in 1995. 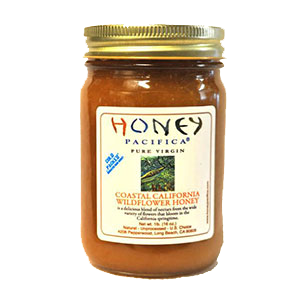 Honey Pacifica - Cold packed coastal Californian honey is produced from a variety of coastal blossoms in Southern California. 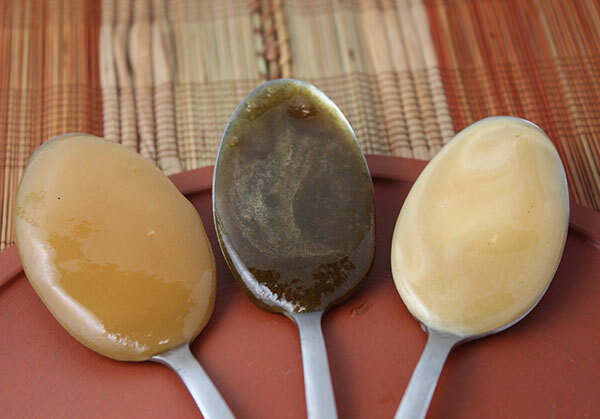 Mountain Rose Herbal Raw Honey Spreads - These are medicinal raw unheated honeys infused with different herbs. 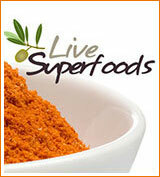 Four different varieties are available for sleep, inflammation, allergies and immune health. 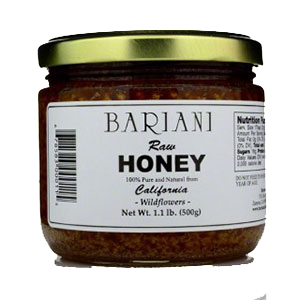 Bariani Wildflower Honey - Bariani honey comes from bees that live on the Bariani olive orchard. 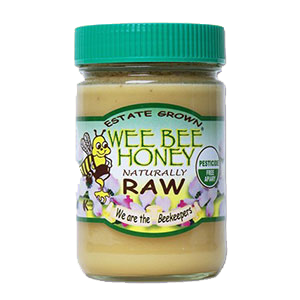 This raw honey is characterized by light floral flavors and fine textured crystals. It is unheated, pure, unpasteurized, and unprocessed. Noniland Honey - A sometimes hard to find specialty brand derived from many different superfoods as well as noni blossoms. 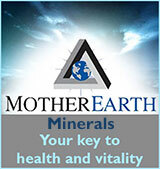 Produced on the Hawaiian Island of Kaui and created by health educator David Wolfe, it is one of the best available. Raw honey can be dangerous to infants under one year of age as their intestinal tracts are not strong enough to fight off potentially harmful bacteria. 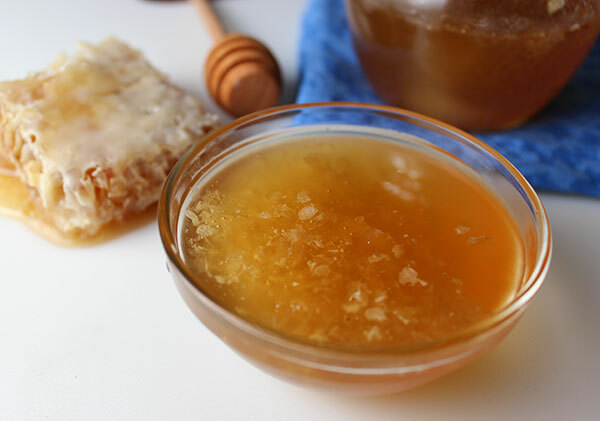 Unpasteurized honey sometimes contains dormant endospores of the bacterium Clostridium botulinum, which can be lethal to new born babies and infants.